It’s been a little over 2 weeks since I’ve blogged! I was a poor planner and didn’t have any posts in reserve for sharing with you while I was away tending to our move. But now that we’re moved and semi-settled in with only a few more boxes to go, I’m free to cook again! Here’s a post that I started working on before the move for a recipe that I’m really excited to share because it’s become a part of our regular rotation. I rarely buy cookbooks. I think I own a total of 8. 2 were gifts, 1 is my dad’s passed down to him from my maternal grandmother, 1 I “borrowed” from my mother-in-law and 3 I actually bought. With the advent of cooking blogs, I’m not sure that this part of me will change anytime soon. This recipe, however, is inspired by Suvir Saran’s recipe for Cauliflower Hyderabad Style in his cookbook Indian Home Cooking, and it’s the reason I bought his book. I read his cauliflower recipe sitting on the floor of Barnes & Noble and knew I needed to make it immediately that night. That’s powerful. And it didn’t disappoint. 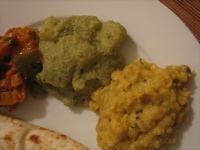 So far, we’ve tried three or four recipes from Indian Home Cooking and have been satisfied by them all. A few of the recipes are for things I grew up eating at home and already regulars in my kitchen, but more than a few are interesting and new (and hey, the title is Indian Home Cooking afterall so I was expecting a few of the regulars). I’ve made this recipe substituting eggplant for the potatoes. Paneer or tofu may work well too. If you try out a different main ingredient, let me know. I haven’t tried it with cauliflower as suggested in Indian Home Cooking. For some reason, the combination doesn’t really appeal to me. Also, don’t be intimidated by the number of ingredients this recipe calls for – most of them are things you have in your pantry. And in a pinch, I’ve made this without the mint and just substituted twice as much cilantro (with the stems!) which packs a lot of fresh, tangy flavor on it’s own. In a food processor or blender, blend the peanuts to a consistency of semi-fine crumbles. 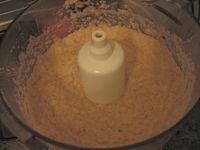 Add the remaining ingredients for the onion-coconut paste and process until you have a smooth paste. Keep aside. 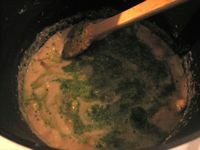 Add the mint-cilantro paste ingredients to the food processor bowl and process until you have a smooth paste. Add a little water if necessary. In a large stockpot, heat about 2 tablespoons of oil on medium-high heat. Add the mustard seeds and when they pop, add the cinnamon sticks, cardomom pods, cloves, curry leaves, ginger and garlic stirring occasionally for 2-3 minutes. Add the onion-coconut paste and salt to taste (I add about 2 teaspoons) and cook uncovered until the water evaporates from the paste and the oil separates. Steam pockets will develop that make the paste puff up so be sure to keep an eye on it and stir. Cook for about 7-10 minutes. Add the potatoes and stir until the pieces are coated with the mixture. Cook with the stockpot partially covered so some steam can vent out for about 15 minutes until the potatoes are slightly tender when poked with a fork, stirring occasionally. Add the coconut milk, cumin powder, chili powder, garam masala and mint-cilantro paste and stir well. Cook for another 10 minutes halfway covered stirring occasionally or until the potatoes are completely tender. Add salt to taste and shower with cilantro. 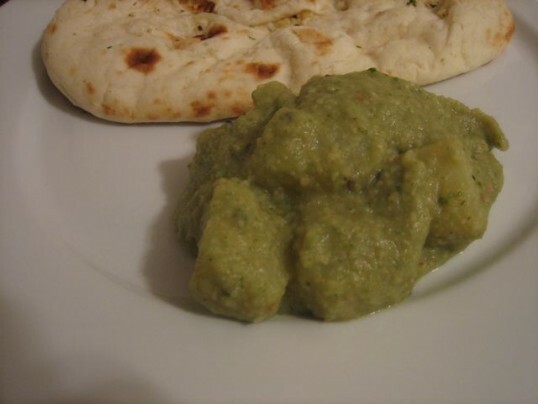 Serve hot with roti or naan and rice with raita. Good to see you back. Was missing your recipes for some time. This dish looks appetizing, although the number of ingredients make it lil difficult to remember. I might take print of this. Good luck with the new house. ND: Thanks! I was starting to go a little stir crazy without being able to unwind in the kitchen. And eating out loses it’s glory quickly. Was wondering where you ended up at. Going to have to make this with paneer because not an eggplant fan and I finally found a place that sells it. So excited! ND: Haha I’m here! I’m here! Let me know how the paneer turns out. I think that’s definitely my next try for this recipe. I would probably just saute the paneer in a separate pan until it’s golden brown and then add it to some boiling water with a pinch of turmeric so it get nice and soft before adding to the curry. Btw I stock up on paneer when we go to the Indian grocery store and keep it in my freezer. The day I’m going to use it, I just put it in the fridge that morning. Impressed that you’ve avoided cookbook addiction…I am really hopeless on that front. ND: Alpa, thanks! Just checked out your blog and I love it! Any other favorites from IHC that we should try? Rajat made his briyani which was pretty delicious. So excited to find your blog now! I LOVE Indian/Asian dishes and will be trying all these! ND: Thanks! Really happy to have found yours as well. Thanks for giving Indian Home Cooking credit as you blog. How wonderful it has been to go through some of your posts. I shall continue coming back. Wish you many successful and tasty adventures around the kitchen and food.